Bicycling barefoot is one of the less common items done by children. 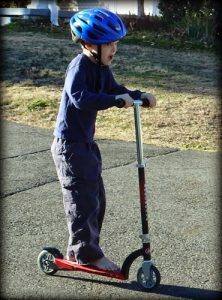 However, as this boy shows, riding a bike or scooter without footwear is not a problem. Going to the pool or a friend’s house during the summer months is common with children. There is no need to wear shoes between home and these destinations, especially when they are promptly removed upon arrival. Some bicycle foot pedals may be uncomfortable or slightly harder to grip without shoes, but different versions may be purchased that are nicer on bare feet. As a child becomes more familiar with barefooting, it likely will not be an issue. A helmet is always a good idea when riding either of these devices for head safety in case of falling or a collision.